Welcome to the storybooks page! Here you'll find exciting stories of Alx and Scooter's adventures as Ninja Seals! Geared towards kids aged 5-9, these hilarious books are action-packed and full of fun. No cringe-worthy PC nonsense, no shallow moral lessons, and no pandering to vapid pop culture tropes. These are straightforward adventure stories meant to entertain and to just let you kid be a kid. New children’s book coming soon! Alx (pronounced "Alex") and his cousin Scooter are two ordinary seals by day, and ninja seals by night! One evening, the ninja seals spot something strange zooming around in the sky. Seconds later, they're attacked by a flying sea turtle...which is wearing a powerful jetpack and missile launcher! What on Earth is going on? In this two-book story, join the ninja seals on yet another hilarious adventure full of crazy characters and sinister plots! Alx (pronounced “Alex) and his cousin Scooter are two ordinary seals by day, and ninja seals by night! 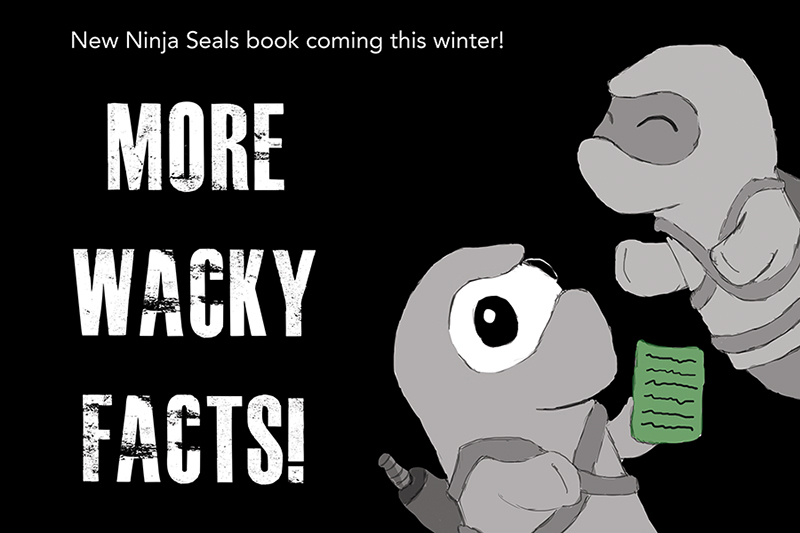 In this book, the ninja seals are excited to share some amazing and wacky facts with you! Do you know which mountain is the tallest in the world? Which animal can't jump? What happens when sea lions listen to music they like? Read the book and find out. The answers might shock you! Plus, you'll learn many more fun facts! Alx (pronounced “Alex) and his cousin Scooter are two ordinary seals by day, and ninja seals by night! One evening, while busy in a workshop, someone - or something - starts banging on the front door! Before they know it, Alx and Scooter are caught up in a chaotic nightmare where they are once again forced to take action as ninja seals. And this time, they’re up against a large, metal monstrosity! What is its purpose? What does it want? You'll never believe it! Alx (pronounced "Alex") and his cousin Scooter are two ordinary seals by day. And at night, they dress up as ninjas! From the shadows, they fight crime and help other seals. When a large, mysterious monster appears and commits a series of strange robberies, the ninja seals take action in order to protect their beloved town. But how will they thwart a nearly unstoppable enemy? And when they uncover a plot that's bigger, more dangerous (and more goofy) than anyone could have imagined, the ninja seals will have to use every ounce of their ninja skills to save the day! Join Alx and Scooter on their zany, action-packed adventure with all its hilarious twists and turns!